Implied volatility in the world’s most-traded currency pair has plunged this year, with the 12-month measure in euro-dollar falling to its lowest level since July 2014 last week. The exchange rate has closed in a $1.1250-$1.1450 range 75 percent of the time in 2019, according to UBS Group AG. 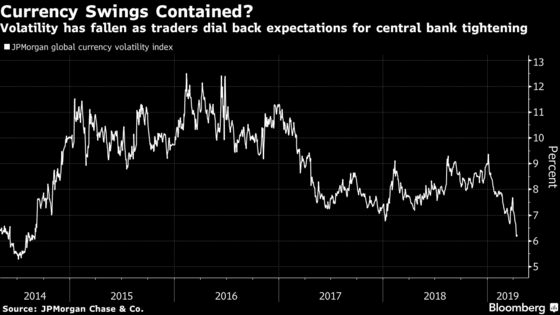 “As is often the case, range trading can mask an underlying build-up of pressures that get released eventually,” said Themos Fiotakis, head of currency and rates strategy at UBS. He predicts the euro will climb to $1.20 by the end the year.